Can I view my unapproved timecards? How do I view my unapproved timecards? Select a location from the dropdown. Go to the Attendance tab. Click Export > All Timecards > CSV File > Enter in range > Export. 6. 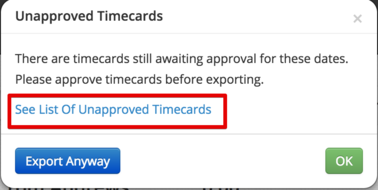 Click 'See List of Unapproved Timecards'. You will then receive a download of all unapproved timecards for that date range. Can I export employee timecards?